The player known simply as Chef added some colour to the Sixes. One of the world’s biggest amateur cricket tournaments ended last Saturday in Chiang Mai after one week of exciting competition, socializing and getting to know Thailand’s second largest city. 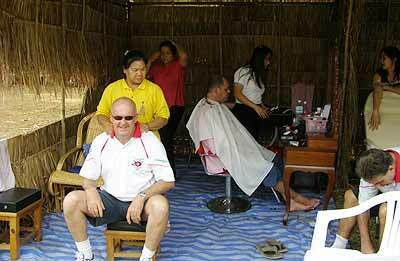 The big-hitting Steve ‘Crunch’ Christie was on his 10th tour to Chiang Mai with his Australian team the Warathais. A record number of 33 teams from 15 countries took part in the week-long tournament, which was held at the historic 109-year-old Chiengmai Gymkhana Club grounds in the heart of Chiang Mai. At the end of a long week of tough competition the biggest winners were the many local children who play cricket in Chiang Mai’s junior league, with all proceeds from the annual Chiang Mai International Cricket Sixes going towards developing the game locally at the junior level. Former Australian international Trevor Chappell was one of the stars of this year’s Sixes. An indication of how successful the local junior cricket program has been over the many years the tournament has been supporting it was the inclusion of a team of young local players in the senior competition for the first time. A team of young Thai boys aged between 15 and 17 entered the senior competition and played under the team name of Thai Thevada, and they surprised everyone by doing very well. They had a couple of wins and a narrow loss in the provisional games to determine which of the four groups the various teams are grouped in, and Thai Thevada made it into the second top group, the Shield. 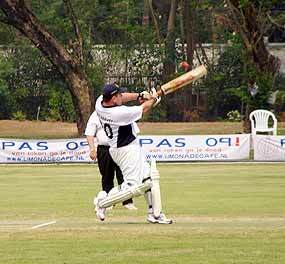 Troy Harvey slams a six for Australian team Yarrambat on the final day of the Chiang Mai Sixes. The tournament is divided into four groups according to the playing levels of the team - some teams are made up of very amateur pub sides while others include regular first-class players and even former internationals. So being drawn into the Shield group, the second highest at the tournament, seemed a bit tough on the youngsters at first, but they soon proved the doubters wrong. In fact, the Thai Thevada team did so well against teams of grown men who had played the game all their lives that they made it through to the semi-final, along the way clocking up some great victories. 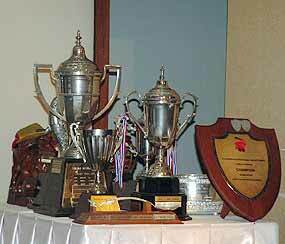 Some of the trophies for the winners at this year’s Sixes. Their dream run came to an end, however, when they faced the Tokyo Wombats, a team of expats based in Japan, in the Shield semi-final, but it was a narrow, and heartbreaking, loss. The Thai boys batted first and made a good total against some tight bowling from the Wombats, setting the Tokyo boys a good run chase. But the Wombats dug in and the match went down to the final ball with the Thais one run in front. As the crowd cheered on the young Thai bowler as he ran in to deliver the final ball, the Wombat batsman stepped up the wicket and hit him for two runs and a victory. The poor Wombat batsman later came and apologized to the Thai team, saying he felt terrible that he’d bought their great run to an end. In typical Thai fashion the boys smiled and told him “mai pen rai”. While the local boys grabbed a lot of attention, a team of Englishmen were having a lot more luck than their national team and quietly making their way through to the finals of the top flight Cup group. The most exciting match at this year’s Sixes, and one of the most exciting finishes in Sixes history, was this year’s Cup final. Bangladesh team the Cricketeers batted first in the Cup final against English side the Gloucestershire Gipsies and made a subdued start, taking only 12 off the first over and eight off the second. Tight bowling and good fielding by the Gipsies held the normally big-hitting Cricketeers to a modest total of 75 in their innings. The Gipsies then took the game to the Cricketeers when it came their turn to bat, smashing sixes and fours and racing to 46 after three overs. The match went down to the wire with the Gipsies needing 10 runs off the last two balls and they hit a four from the second last ball and then smashed a brilliant six off the final ball for victory. It was the most exciting finish in the 20 years the Sixes has been held and had the very vocal crowd on their feet. 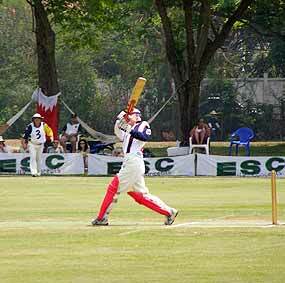 The rest of the finals were also top quality cricket, if not as exciting as the main game. In the Bromley Shield final, Japan-based team the Tokyo Wombats batted first against the Irish Pub Gang Green from Thailand and clocked up 67. Tokyo Wombat Ian Gason, who suffered a fractured nose during his team’s earlier match against Thai Thevada, returned to take the field against the Irish Pub Gang Green and opened the bowling for his side. However, Gason’s efforts were in vain as the Irish Pub Gang Green raced to a winning total of 69. 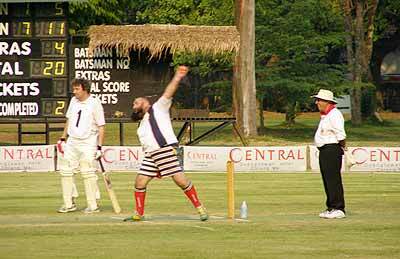 Two Thai expat teams made it into the final of the Bowl group when the Floggers and Robbers took on the Southerners. The Southerners batted first and scored the respectable total of 85 runs for the loss of three wickets, and in reply the Floggers and Robbers stole the match with a winning score of 86 for one. There was also an exhibition game on the final day between an All Star team led by former Australian international Trevor Chappell and a Rest of the World side led by former Sri Lanka international Lantra Fernando, and it was one of the best games of the day. Young Thai player Suranya “Off” Chanai, who has come up through the local junior league and played with the Thai Thevada side, joined Chappell’s team and bowled very well, helping restrict the Rest of the World to 57 runs. “Off” also played a starring role with the bat and hit the winning runs for Chappell’s All Star team, with a great six off the second last ball followed by a quick two runs off the last ball for a winning total of 58. The Joe Carpenter Plate final saw two Aussie sides, new team Yarrambat and regulars the Sugar Shack Postels, battling for honours. Yarrambat scored 83 in their innings while the Sugar Shack melted with only 51. There was also a women’s match between local ladies team and defending champions the Chiang Mai Chassies and visitors the World Women’s Dixie Bells. The more experienced Chassies knocked up a big total or 71 for victory, while the visiting ladies only managed 48 in reply in an entertaining match which featured champagne bottles behind the stumps at each end. The last of the finals was in the Spoon division and the Maythais, an offshoot of regular Chiang Mai tourists the Warathais, faced the IOS Malakas in a low scoring game. The Maythais had a good knock of 52 in their innings, while the Malakas knocked up 54 in reply for victory. Tournament director Maurice Bromley and other officials presented the trophies to the various winners at the end of play. The final party was held on Saturday night at the Central Duangtawan Hotel where a number of items signed by famous players were auctioned off with the proceeds going towards developing local junior cricket, which is going from strength to strength. The Sixes official sponsors, European Safety Concepts (ESC) headed by Steve Graham, and the Chiangmai Mail have announced that next year the Cricketers can continue to count on their support. The winning team will be able to return next year with an added bonus of complimentary accommodations while the runners up will enjoy a fun packed weekend in Pattaya. San Miguel Beer, an additional sponsor, provided cold brew throughout the event and all were very grateful. 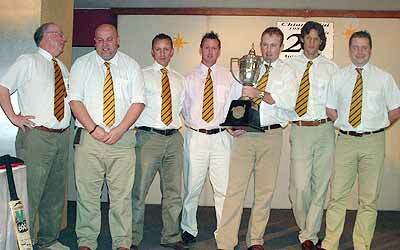 The Gloucestershire Gipsies won the Cup title in the most exciting finish in Sixes history. They collected their prize at the final party on Saturday night. 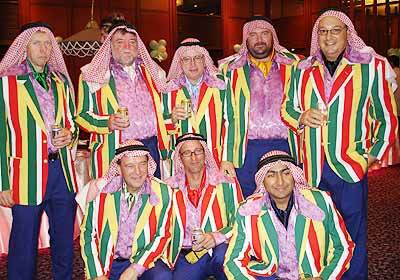 There were some colourful characters at this year’s Sixes, particularly this team from Bahrain, the Awali Taverners. The Thai Thevada team with some of their volunteer coaches and support staff. To save anyone having a bad hair day, a barber shop was set up for players at the Gymkhana Club grounds. Local women’s team the Chiang Mai Chassies defended their title this year, then found time to celebrate. Every year each team plus officials are looked after by a “personal assistant”, a student from a local university who gets the chance to improve her English. The Royal League’s lady member, Samantha Richdale, kept her 100% scratch play record with a fine two over par 74 at the Highlands last Tuesday. Her accurate game, wise club selection and overall confidence placed Sam a cut above the other competitors in this tournament, and like any good professional, she putts well. Sam completed the course six shots clear of joint second Dennis Dobrick, Steve Polaski and Grahame Curry, who also putted well. And Steve made a notable recovery after carding an eleven on the par 5, third. Will Samantha ever card an eleven? “The day Hell freezes over,” says Grahame Curry. But should things cool down in Dante’s inferno, she will be keeping good company like the rest of us. Severiano Ballesteros holed out on the 9th at the 1974 Spanish Open in 11 shots; Greg Norman took 14 strokes on the 17th in the 1982 Martini International; and the legendary Arnold Palmer carded a 12 on the 9th in the 1961 Los Angeles Open. In the League’s Little Man competition, Dennis Dobrick was on song by hitting 15 out of 18 greens in regulation to score an impressive gross 77, net 67 - enough to edge Grahame Curry into second place. A bogey and double at the 9th and 10th, respectively, spoilt Grahame’s chances, but he completed the last 7 holes in one under par to card an overall 79, net 70. 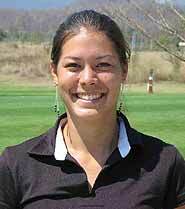 Joint third placer, Kari Sirelius also broke 80 to end up with a net 71, and in form Hong Kim had the same net score to take a top three placing for the third time in four outings. It was Malcolm Tetley again - taking the honours for the second week running in Chiang Mai Golfers’ Tuesday Stableford event. Malcolm has yet to break 100, but his net 66 earned him 42 points, which looks like another job for the handicapper. David McCunnall turned in his best score for a long while, but a net 70 and 38 points wasn’t enough to dislodge Malcolm, much to David’s disbelief. This week’s skins winners were Malcolm of course, Kjell Hansson, Inge Billman, Archie Lee, Jim Catterson and Kieran Savage. Despite Gordon Langtry carding his best ever round, he was still 5 shots off the pace in Happy Bar Std’s stroke play competition at Mae Jo last Monday. Gordon’s net 73 couldn’t compete with the day’s winner, Neil Alper, who shot an impressive net 68 following 2 triple bogeys. David Cameron and Jack Cooper managed joint second with respectable rounds of net 70. Hong Kim is no stranger to the Highlands course, and local knowledge my have played a part in placing him first in Wednesday’s field with a net 68, which included a birdie on the difficult 8th. Hong’s golf is coming along in leaps and bounds and last week’s effort saw his handicap cut by 1.5 strokes. Good news for Don Peterson and Mike Nuen, who had to content themselves with second and third this time out. Friday’s event saw a return to Mae Jo, where the ever improving Gordon Langtry was leader in the clubhouse on net 72, right up to the final groupings, when Peter Efremgan holed out on the 18th to equal his score. Nevertheless, this was a first time win for both players. Lastly, Happy Bar Std’s will be travelling on their monthly tour to Chiang Rai next week, where they compete at Santiburi and Waterford for the Chiang Rai Cup. For further information visit www.theroyalleague .com, www.chiangmaigolfers .blogspot.com or ring Garry Walker on 081 032 8803, and for Happy Bar Std’s ring Noel O’Dwyer on 089 256 5705. Winners in the inter-schools archery tournament involving students from Prem, American Pacific International School and Dara Academy. On a hot but breezy day last Sunday week, Chiang Mai Bow travelled just up the road from its Mae Rim headquarters to Prem International School, where it held an inter-schools tournament involving students from Prem, American Pacific International School and Dara Academy. The main event comprised 36 arrows each at targets of 18 and 25 metres, and a junior competition consisting of 72 arrows from 10 metres. The overall winner was Nathdanai Thongtab from Prem, sharp shooting his way to a worthy 332 points, followed closely by schoolmate Lance R See on 324. Sarunyu Wasukretiwanit of American Pacific came in third with 290 points and the leading girl was Prem’s Julia Simhony scoring 212. An X10 is scored in archery when the arrow hits dead centre of the target, and Jomyut Leangsomboom of American Pacific managed nine of them on his way to a winning score of 634 in the boy’s 10 metre section. And Prem’s Jamie Mackay achieved two X10s in his second place score of 562. In the girl’s junior event, the smallest competitor showed the biggest heart when Jeeraporn Moore from Dara Academy shot her way to a winning points tally of 605, which included four X10s. American Pacific’s Pemica Klasukhon came second with 545 points and one X10, and Noramon Chongsanguan from the same school finished third on 534 and two X10s. So, on the day, all three schools produced individual winners, but the teams from Prem and American Pacific tied on four top placings each. 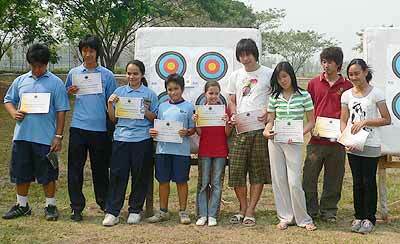 John and Daeng Moore have promised more archery tournaments in the near future. There intention is to provide special school programming and any schools or individuals interested in competition, practice or taking up the sport, full facilities, tuition and equipment are available at Chiang Mai Bow’s clubhouse in Mae Rim. With Songkran still a few days away, last Friday’s matches involving the top two teams of the Chiang Mai Pool League were washed out for different reasons. 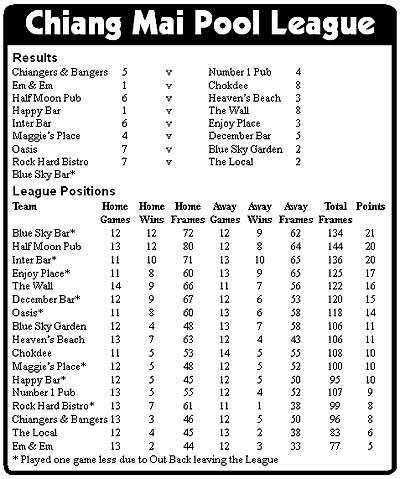 While Blue Sky Bar went out of action due to the disappearance of Out Back, Half Moon Pub claimed a 6-3 walkover when their opponents materialized 10 minutes late. Lom winning for The Wall. The Moon was well within its rights to take the point from Heaven’s Beach without a ball being struck, and it serves as a warning for teams to turn up on time. But the question remains whether this was a satisfactory way to close the gap on the leaders to one point. In the fight for the top, The Moon was joined on 20 points by Inter Bar, who methodically disposed of Enjoy Place. Enjoy are now in danger of moving out of the reckoning. With nine weeks left of the season, they are four points off the pace. Just one step below Enjoy, a new-look Wall put on a dazzling performance by almost whitewashing Happy Bar. Although several scratched blacks decided frames - including Happy’s solitary one - The Wall will be a serious challenger next season if they can build on their current momentum. Another much improved outfit, December Bar, maintained their high status in the League with an exciting win at Maggie’s Place. 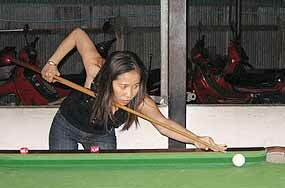 After December moved into a 4-0 lead, Maggie’s leveled the score before the visitors took the deciding frame. And by the way, congratulations to December player and League coordinator Shaun and his wife, Mai, who became parents of a baby boy last week. In other matches, Chiangers & Bangers continued their fight to stay out of the basement with a narrow win over Number 1 Pub. Honours were shared in the singles, but attention focused on Number 1’s diminutive Fern, who, with great strength, won by holing the black in a bulk end pocket off the break. Unfortunately for her and the rest of the side, Chiangers went on to take the first two doubles. Once La Villa, now Chokdee, they were the only League ladder movers last week - climbing 4 places after whipping Em & Em, 8-1. Em & Em claimed second spot last season, but find themselves bottom this. Ironically, to avoid the wooden spoon they must catch The Local - the side famous for winning the championship one season and coming last the next. And they duly obliged Em & Em last Friday by going down 2-7 at Rock Hard Bistro - another team in need of points. Lastly, debutants Oasis continued their impressive first term with a convincing 7-2 win over Blue Sky Garden to stay 7th in the League. And don’t forget, there are no matches this coming Friday because of Songkran. This week’s winner, left to right are: Ram, Waw and Emely, with Colin the happy chap at the back. The number of ten pin Chiang Mai Bowlers at PS Bowl rose by 50% in their weekly event last Thursday - keeping Les Harvey working overtime to calculate the scores. Seven teams of four and one of five went into combat and once again the handicapping system kept the competition tight with just a few pins separating the sides. Only one team produced an average score of over 200 and they were eventual victors Colin, Waw, Ram and Emely, who was also one of last week’s winners. Anyone interested in joining Chiang Mai Bowlers need only turn up any Wednesday before 3.30 pm and make themselves known to Les. 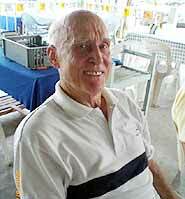 Kjell Hannson, Olympic medalist from Sweden. Chiang Mai Golfers recently discovered that one of their members, Kjell Hannson from Gothenburg, Sweden, competed in two world Olympic Games. Now 76 years old, Kjell recalls the 1956 games in Melbourne, where after rowing in the singles he grabbed a silver medal in the fours, before competing further in the eights. Kjell made a return to the Olympiad in Rome in 1960 and remembers a lot of controversy related to drugs. Still knocking a golf ball around, Kjell has put in a few winning performances at Chiang Mai Golfers and says that his fitness is down to years of hard training. He also doesn’t smoke or drink. However, it looks like the Thai weather might beat him. He’s shortly off to Sweden to enjoy a cooler summer and we hope to see him back in Chiang Mai when the heat’s off.